The Treasure Vase was taken to Kosovo by our dear friend Fran Peavy and Jan Hartsough of the non-profit organization Crabgrass as well as the Women in Black who were working in the former Yugoslavia to bring peace and healing to the women post war. Carefully packed in its special copper-lined basket made by Anne Wilson and cushioned in lavender, the vase was placed in the meeting room of the Women in Black International Conference to gather energy and prayers and offerings from the many corners of the Balkans represented there. Fresh rosemary, thyme, and bay leaves from Montenegro were added to the cushioning lavender embracing the vase. The vase witnessed with the Women at their silent vigil in Podgorica, and then traveled on to Kosova. 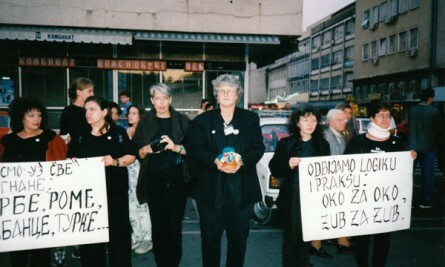 There the Women at the Center for the Protection of Women and Children in Pristina decided it should be buried in Djakova, one of the most devastated cities in Kosova. The Kosovar women hope to plant a tree over the vase as a visual reminder that will connect them with its healing powers, and protect the vase itself. This entry was posted on Thursday, June 6th, 2013 at 12:31 pm	and is filed under Burials. You can follow any responses to this entry through the RSS 2.0 feed. You can trackback from your own site.